Saatchi Art, the marketplace for original paintings, drawings, photography, sculpture and other artworks, has rolled out a customer service via its new iPhone app that promises to spur sales by helping art buyers with their selections. 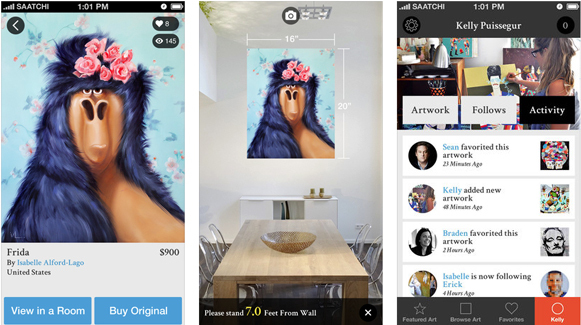 As part of the new app that lets you discover a massive amount of original artwork, Saatchi also gives you some idea of how that art will actually look on your wall or in your room. The sticking point, especially with buying art online, is the possible discrepancy between what you see on the screen and how it will actually fit in your home. To move buyers through that roadblock, the app allows you to view the work to scale directly on your wall and to use the iPhone camera to share that view with friends and family, in case you need extra help deciding. The app lets you browse thousands of artworks according to medium, size and price, discover and follow artists, check the hottest new trends and survey what Saatchi Art’s curators are touting. Once you’ve made your selection, you just measure the distance between the wall and the art you like and the app automatically superimposes it to scale in that location. Visualizing art in this fashion is not exactly a new concept: Pixels.com does something similar with its augmented reality iPad app. But Saatchi ‘s utility is a lot easier to use. 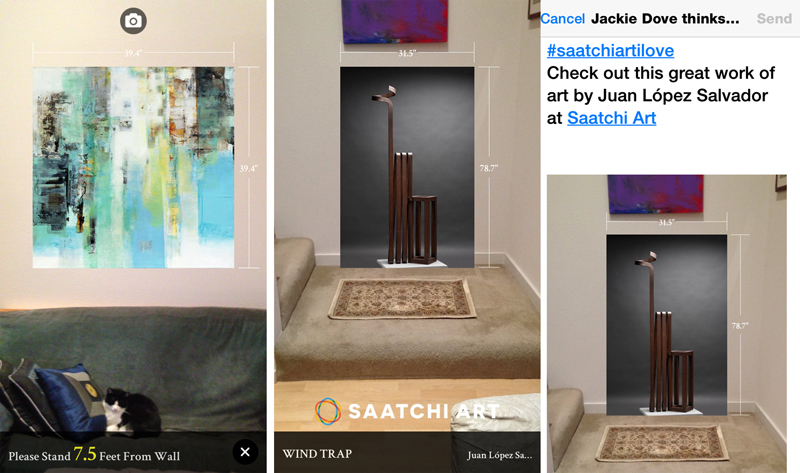 With Saatchi, you just stand at the designated distance from the position of the art to see it in real time on your wall and take a shot for your reference. Regardless of what you decide, there’s a seven-day money-back guarantee, if you get the piece home and it’s not what you expected or you’ve changed your mind.